By 1907 Toronto had received permission to establish its own municipal distribution system for hydro-electric power, but lacked the necessary infrastructure. 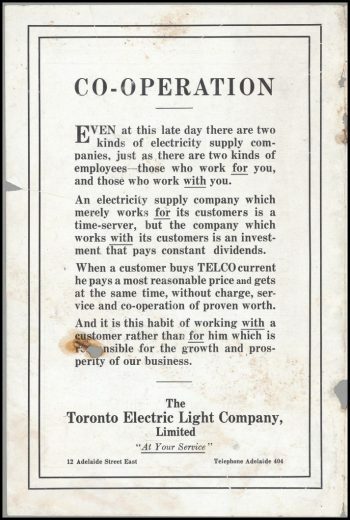 Repeated attempts to buy out the assets of the Toronto Electric Light Company were unsuccessful, since TELC would not sell at a price acceptable to the City. 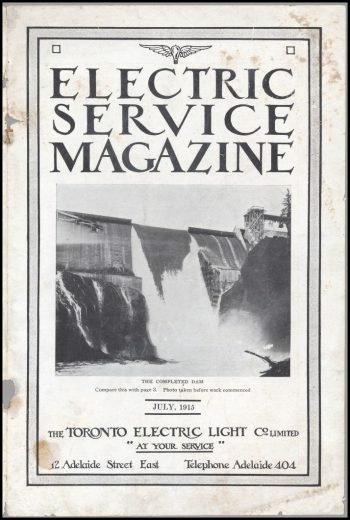 Thus, on January 1, 1908 Toronto ratepayers were asked to approve a $2,750,000.00 bond issue to build a municipal network which would distribute Hydro-Electric Power Commission of Ontario (HEPCO) power. The bond issue was approved, and an agreement was signed with HEPCO on May 4, 1908. A sub-department under the City Engineer’s Department was formed to construct the distribution plant throughout the city. Mr. K.L. Aitken, under the supervision of City Engineer C.H. Rust , undertook the work of constructing the electrical sub-stations, the 13,000-volt main distribution line, the 2,300-volt primary feeder and the three-wire, low voltage secondary lines. It was Aitken who coined the name for the sub-department: the Toronto Hydro-Electric System (THES). 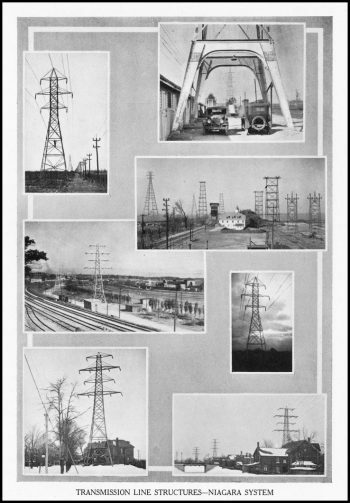 At the same time as work in Toronto was progressing, the transmission lines for HEPCO power between Niagara and Toronto were also being constructed. 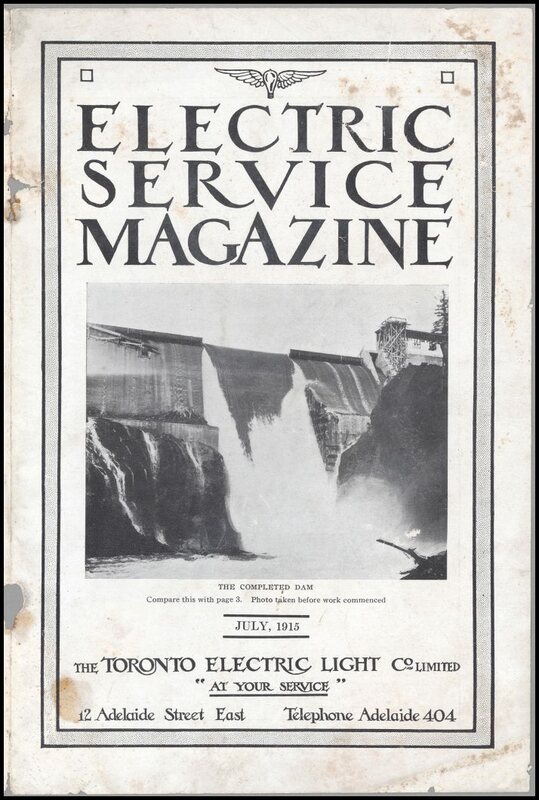 Power first reached Toronto over the provincially-controlled transmission lines on February 24, 1911. 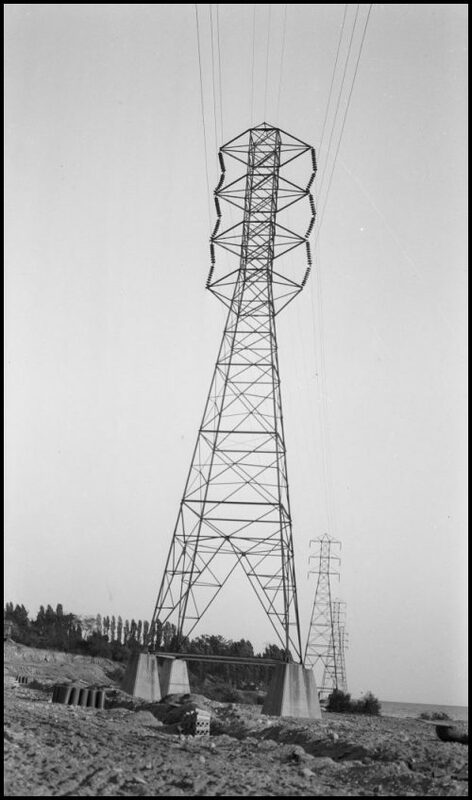 These photographs show some of the types of transmission towers between Niagara Falls and Toronto. 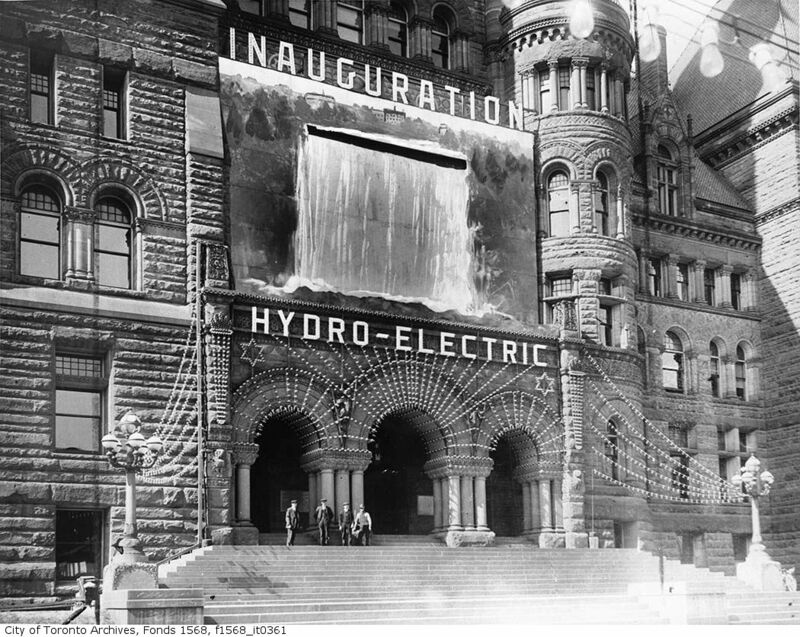 The official turning-on ceremony for Toronto Hydro took place on May 2, 1911. After a dinner banquet at the King Edward Hotel, the guests and dignitaries proceeded to City Hall where they met a large crowd of on-lookers. A huge picture of Niagara Falls was hung over the main entrance to City Hall, and the crowd was to be treated to the sight of water pouring over the picture as soon as the lights were turned on. 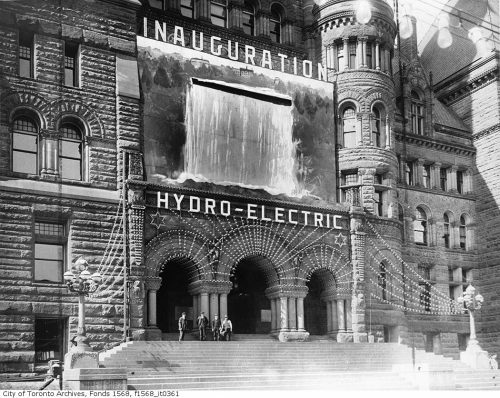 After the speeches, Premier Whitney called for Adam Beck to press the button and ceremonially start the flow of electricity to Toronto. The lights came on to the cheering crowds, the water started to cascade, and several of the guests standing below were drenched. One month later City Council transferred control of the “System” from the City Engineer’s Department to a board of three commissioners known as the “Toronto Electric Commissioners.” The first commissioners were P.W. Ellis (chairman, appointed by City Council), Mayor G.R. Geary (ex officio) and H.L. Drayton (appointed by HEPCO). 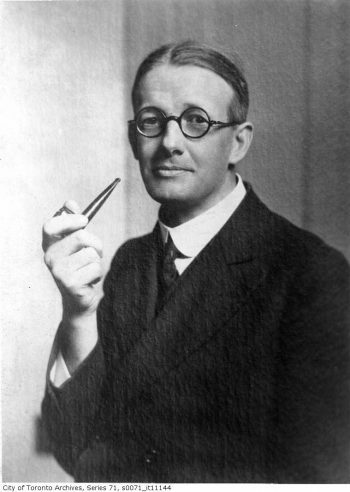 Ellis wanted an experienced man to be his general manager, and in 1913 he entered into a contract with Englishman H.H. Couzens. Couzens’ whole career had been in municipal electrical service, and he was more than competent to take over the fledgling THES. P.W. 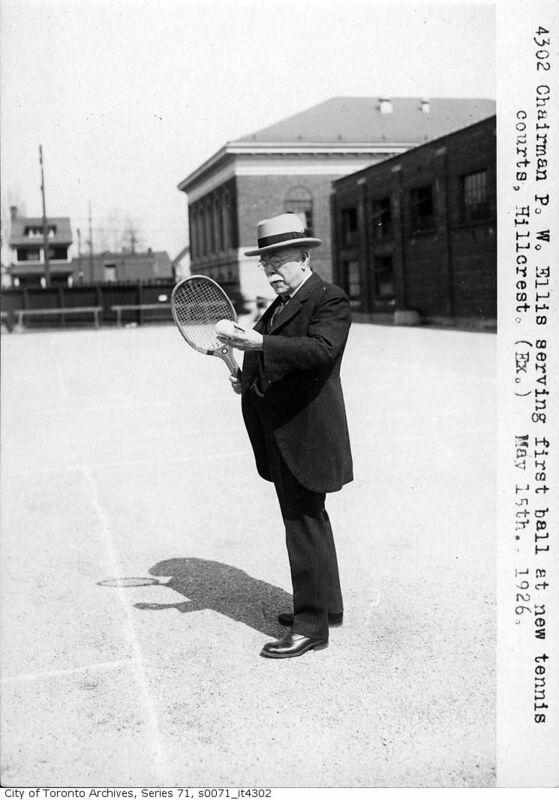 Ellis did double duty – serving as the chairman of both the Toronto Hydro-Electric System and the Toronto Transportation Commission. H.H. Couzens served as the general manager of the THES from 1913 to 1924, and oversaw operations at a critical period for the new utility. Success came fairly easily, and by the end of 1913 the THES had close to 25,000 customers, exceeding the number of TELC customers. 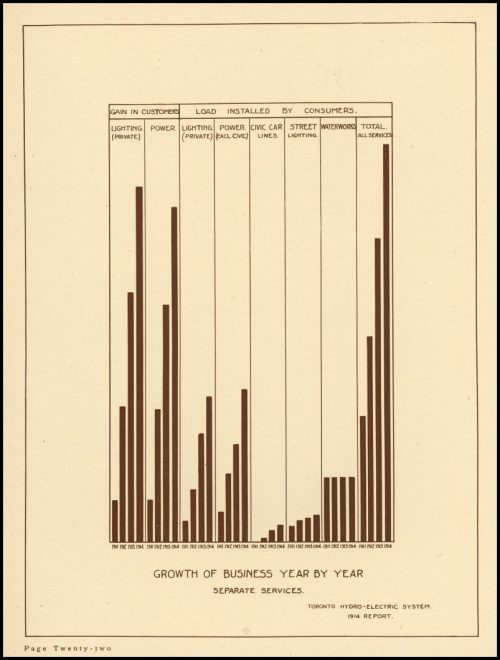 This chart shows the continual increase in electric power usage by both home and industrial consumers from 1911 through 1914. However, in 1913 and 1914, there were a number of power interruptions, and residents who had switched from TELC were quite upset. The THES was actually forced to buy power from TELC, which proved to be an embarrassment for the commissioners. The strategy of Adam Beck to address customer dissatisfaction was to use “the weapon of cheapness.” He mandated very low rates to be charged by THES, and customers enjoyed prices that were 50% less than those of TELC. 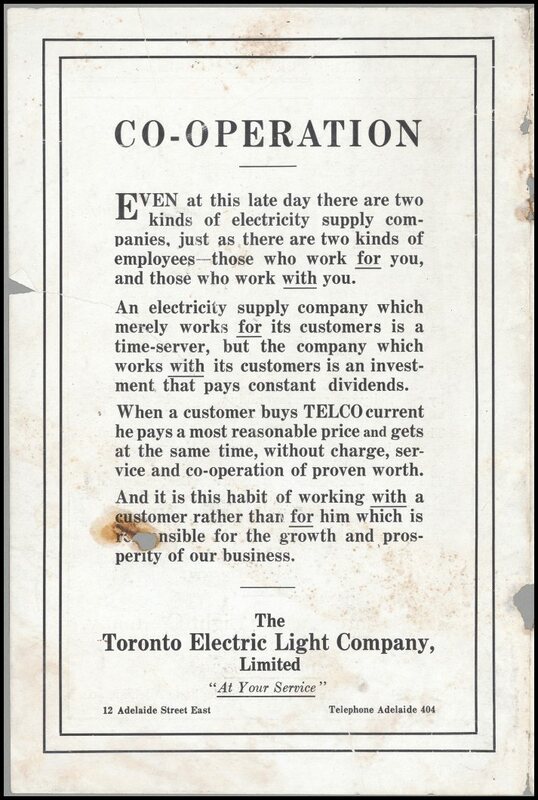 The back cover of this magazine illustrates the efforts of the Toronto Electric Light Company to dissuade customers from switching to the Toronto Hydro-Electric Company. With the arrival of World War I, there were increasing demands for power, and from the fall of 1917 to the fall of 1920, the winter months were marked by power shortages of increasing severity. The situation was finally relieved in the early 1920s when the charters of TELC and the street railway expired, and the municipal system became the sole distributor of power in Toronto. In 1921, William Mackenzie’s franchise to operate streetcars in the city expired, and the Toronto Street Railway became defunct. The City had an act passed by the provincial government providing for the formation of the Toronto Transportation Company. The TTC was to take over and operate the former street railway and the other civic lines that had been constructed by the City. Like the THES, the TTC was to be run by a three-member board of commissioners, none of whom could be a member of City Council. There were many points of connection between the TTC and THES, such as the joint use of poles, and electric railways were a major market for electrical power sold by the THES. To save money and to be efficient, council decided to amalgamate the THES and the TTC. The two organizations shared two commissioners–P.W. Ellis and George Wright–and H.H. Couzens served as the general manager for both. Even after the TTC and the THES split in 1924 when Couzens left Canada for a job in Brazil, Ellis and Wright continued to serve on both commissions. P.W. Ellis died on April 21, 1929, after having been the chairman of the THES for eighteen years. These towers were along the waterfront in Toronto.